The Arts for a Better Future workshop is a one week get-your-feet-wet arts exploration event where participants enjoy inspiration, encouragement, skill development, and networking with like-minded people. Who comes to ABF? Administrators, missions leaders, field practitioners, artists, worship leaders, and minority community members have all learned from ABF. ABF is great to take as an individual, but even better with a team so you can explore and plan together. In fact, we divide into working groups for the last phase, so you will leave with plans for communities you care about. Brian Schrag's book Creating Local Arts Together: A Manual to Help Communities Reach Their Kingdom Goals (see site here) serves as the foundation for our interactive instruction time. We infuse the entire event with real life experiences to illustrate how to help communities draw on their artistic resources to respond to their spiritual, social, and physical needs. Interested in earning college credits? Be sure to ask the organizers—many venues include options for undergraduate and/or graduate credit. Click here for a comparison chart of undergraduate and graduate credit options offered in Dallas every year. Come broaden your palette of tools for cross-cultural arts engagement by learning how to be better catalysts and co-creators for local, indigenous creativity! Join us for a week of learning, creating, and discovery! Click on “Event Website” to see costs and all other details! "ABF is, hands down, the best class I've ever taken!" HOW DID ABF COME ABOUT? Arts for a Better Future (ABF) is a workshop developed by the International Council for Ethnodoxologists (ICE) and SIL International. ABF relies on an ingenious learning environment to help participants make doable plans for engaging communities in ways that result in those communities' increased well-being. ABF was first taught at All Nations Christian College (ANCC) in 2011, with the name Arts in Mission. Since then, teaching resources have been published, its workshop structure has become more defined and replicable, and ABF is being taught more and more: annually at ANCC, the Center for Excellence in World Arts (Dallas), and Alaska Bible College. It’s also been held at Jamaica Theological Seminary, Daystar University (Nairobi Kenya), and in South Africa, Guatemala, Brazil, India, Peru, Argentina, Colombia, and Democratic Republic of Congo. ICE currently serves as the organizational home for ABF workshops, and SIL is adopting ABF as one of its international Service Offerings. Administrators, missions leaders, field practitioners, artists, worship leaders, and minority community members can all benefit from ABF. Talk with your colleagues, friends, and supervisors about ABF. It’s great to take it as an individual, but even better with a team so you can explore and plan together. ABF instructors will accommodate and support your particular group goals as much as possible. We want people to leave with plans that will truly have impact in the world. WHAT WILL ABF TEACH ME TO DO? In broad strokes, you will enjoy inspiration, encouragement, and networking for future ministry; broaden your palette of tools for cross-cultural arts engagement, helping you learn more about being catalysts and co-creators for local, indigenous creativity; and learn to use the EthnoArts Field Manual to help communities you know and care about draw on their artistic resources to respond to spiritual, social, and physical needs. ABF grounds its learning and planning in Creating Local Arts Together: A Manual to Help Communities Reach their Kingdom Goals (Schrag 2013). The Manual was developed in response to requests for a text book and field guide for people working in arts and mission. It is a condensation and reformulation of ideas and experiences of scores of field workers in SIL and other organizations, over decades. We have also created the Shorter CLAT Manual, or Shmanual. This pulls out the core activities and concepts from the full manual, and uses simplified English. We developed both of these with the writing style of a mentor giving advice and direction to someone working with a community. The Manual is structured as seven chapters that correspond to CLAT's seven conversations, presented below. 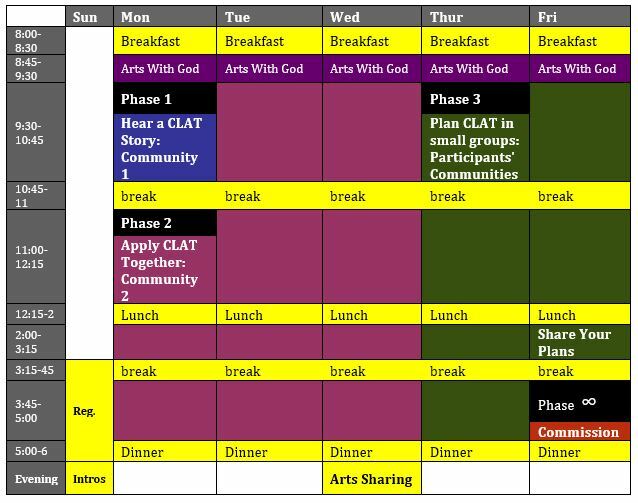 CLAT is a flexible model, drenched in participatory community interaction, helping arts advocates and communities choose and evaluate activities that result in kingdom growth. The arts advocate's role is primarily as facilitator of the process. Meet a Community and Its Artistic genres. Explore artistic and social resources that exist in the community. Performing Step 1 allows you to build relationships, involve and understand the people, and to discover the hidden treasures of the community. Specify Kingdom Goals. Discover the kingdom goals that the community wants to work toward. Step 2 ensures that you are helping the community work toward aims that they have agreed on together. Connect Genres to Goals. Choose an artistic genre or event that can help the community meet its goals. Step 3 reveals the mechanisms that relate certain kinds of artistic activity to its effects, so that the activities you perform have a high chance of succeeding. Analyze Genres and Events. Describe an event as a whole, its artistic forms, and how it relates to the broader cultural context. Performing Step 4 results in detailed knowledge of the art forms that is crucial to sparking creativity, improving what is produced, and integrating it into the community. Spark Creativity. Implement activities the community has chosen to inspire creativity within the genre the community members have chosen. Performing Step 5 actually produces new artistic works for events. Improve Results. 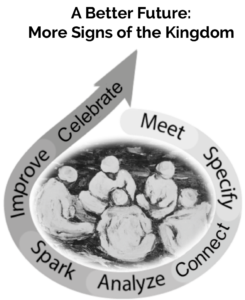 Evaluate results of the sparking activities and make them better. Performing Step 6 makes sure that the new artistry exhibits the aesthetic qualities, produces the impacts, and communicates the intended messages at a level of quality appropriate to its purposes. Celebrate and Integrate for Continuity. Plan and implement ways that this new kind of creativity can continue into the future. Performing Step 7 makes it more likely that a community will keep making its arts in ways that produce good effects long into the future. When participants apply CLAT to their contexts outside of ABF, they should have the goal of touching on each of the seven topics over however long a period of time is appropriate. ABF moves quickly through CLAT because of unique requirements of the classroom. Participants see and hear a story of how someone has applied the CLAT approach in a community that now experiences more of the Kingdom of Heaven. Participants enter into the CLAT process with a representative of a community. They first play the role of an Arts Advocate: they perform interviews, analyze the forms and content of an artistic genre foreign to them, and explore ways to catalyze creativity for a goal that the representative chooses. This results in participants getting to know a human being who represents an actual art form, struggles, and goals that they never knew existed. Participants' eyes are opened to a universe they would previously never expect was interesting or worthwhile. In the global church, artists not connected to Praise and Worship, European hymns, and other artistic languages of wider communication are often invisible to the rest of the world. ABF introduces participants to a living representative of one of those traditions, making a personal bond, and taking on some of the representative's goals for their community. Participants leave aware of and motivated to find out about other invisible artists they will encounter. Later in Phase 2, participants switch roles to become artists in the community they've been exploring. We commission them to compose a new example of the artistic genre following its unique, unexpected, complicated rules that they've discovered through research. Participants break into groups of 3-6, going through the seven CLAT steps with a community that at least one of them knows well. They produce a clear, rich statement of their goals, and draft plans they can implement. Instructors pray for participants, their plans, and the communities who will benefit from implementation of their plans. In some places, we connect to structures that help guide projects into the future. WHAT KINDS OF PROJECTS HAVE PARTICIPANTS DEVELOPED? Trauma healing classes for Syrian refugee children facilitate expressions of lament through storytelling, poetry, calligraphy, and music, bringing healing, hope, and increased shalom to their traumatized communities. Children’s songs show that the Kaqchikel language (in Guatemala) can be sung, integrating Scripture into their lives. Scripture-infused Yurak (dance) helps a Yupik community in Alaska affirm traditional values and bring the community together, decreasing alcohol and drug dependency and helping people to engage with God. Kenyan grandmothers tell Bible stories and sing songs in indigenous styles to their grandchildren and the women of their compound, moving believers to identify as fully indigenous followers of Christ and embedding the Word of God into the community. A birth ceremony with songs, dances, and storytelling encourages the development of godly families in Cameroon. Gospel music and dance increase identity in Christ for learners in a Jamaican school for the blind. The Fur (in Sudan) use juru dance with tombol drum to teach Bible stories, resulting in people of all ages dancing together and celebrating the Word of God. WHAT IS 'ARTS WITH GOD'? Arts with God daily devotional times are designed to provide a space for everyone to interact with God through Scripture in diverse artistic forms. The prevalence of Praise and Worship songs and hymns in the global Evangelical church has resulted in many Christians who have an unnecessarily limited artistic vocabulary for communicating with God. The music focus has also led to keeping Christians with gifts in other arts from ministering, and people for whom music is difficult or foreign feeling frustrated. To open up new, fresh forms of worship, we craft Arts with God sessions according to three criteria. First, Scripture must be deeply embedded in the activities. Second, we integrate arts from as many genres as possible throughout a workshop or conference: dance, drama, visual arts, music, storytelling, etc. Third, we draw on the skills and experiences of instructors, participants, and local communities whenever possible, guiding them to lead Arts with God sessions in participatory, worshipful ways. Worship through Group Painting. Someone reads Psalm 148, and everyone responds by individually contributing a color to a prepared canvas. Worship through the Pen. Read Psalm 62 together, everyone respond to the imagery of God as our strong rock through any form of poetry, word art, written prayers, or prose. Worship through Dance. Read Scripture passages, listen to music, small groups plan movements that integrate the Scripture and music with gestures. Worship through Dramatic Tableaux. Groups prepare a “frozen pictures” for key moments during the reading of Scripture passages, having the audience open their eyes just for those moments. We have detailed directions available to help people lead these sessions, with options for adapting the exercises as needed to local cultures. Participants have produced amazing bits of artistic communication that have challenged, encouraged, and touched everyone. Arts with God has also helped overcome people's insecurities ("I couldn't do that...I'm not a musician! "), resulted in more people being equipped for service (Ephesians 4:11ff), knowing more Scripture, with more imagination, and more lasting impact on their lives. WHAT ARE THE SECRETS OF ABF'S EFFECTIVENESS? ABF requires participants to fulfill four roles: interested observers; active investigators; composers in an art foreign to them; and planners for communities' improvement. Participants do not play these roles. Rather, they fill roles in the context of real communities with real needs and unique arts. Nothing in ABF is pedagogy divorced from reality. This reality-based approach imbues all activities with significance that participants feel deeply, and that motivates everyone to focus and contribute. Very rarely does an ABF student doze. The Create Local Arts Together approach depends entirely on interacting with people as they live and communicate artistically. We don't ask—or care—whether communities have arts that outsiders can categorize as music, or dance, or poetry, etc. Rather, we teach people to identify the communication genres unique to a community, only applying formal analyses if they help people reach their goals. ABF training is neither scripted nor capricious. Rather, ABF depends greatly on instructors to grasp the CLAT model and then modify lesson details to communicate deeply with their students. For example, ABF can be taught to people used to abstract thought and to those more comfortable with concrete ways of thinking. This reliance on fundamentally sound underlying concepts allows ABF to spread to many places. Instructors, then, need to have high levels of knowledge, wisdom, and social competence. Hundreds of thousands of artists with God-given gifts to extend Heaven on Earth are invisible to the vast majority of the world. I'm going to make it my personal goal to find some of these hidden artists. These artists' traditions are qualitatively different from anything I've known, carry unique genius, beauty, and value, and are not to be trifled with or ignored. My first guesses are always wrong. I am not going to make the mistake of underestimating the complexity, value, and efficacy of arts I don't understand. I will not assume that I understand any meaning or form until I have studied the genre for a substantial amount of time. These artists have the capacity to heal, rebuke, educate, worship in community contexts to a depth and extent that I cannot imagine. I will encourage these artists to create for the Kingdom in their own communities whenever I can, and not let myself get in the way. I now know how to do this, using CLAT. WHAT DOES IT TAKE TO HOLD AN ABF IN A NEW PLACE? ABF is the quickest way to join the incarnational creativity movement. If you want to be part of that, look at the roles needed to hold an ABF below. Then, if you’d like to explore possibilities, let us know through the Contact tab above or by email. ABF Host Organizer(s) - Coordinate local arrangements, including finances, food, lodging, promotion, travel, interactions with any local organizations impacted by ABF, communications with artistic community representatives if requested by instructors, recreation and tourist possibilities. Two Lead Instructors - Oversee the training environment and progress through materials. They take notice of how people are doing and issues that come up, modifying the schedule to meet needs. Associate Instructor(s) - Work alongside Lead Instructors, taking teaching and organizational responsibilities as appropriate. Phase 2 Community Representative(s) - Needs to know a lot about the culture and arts of a real community. Will be asked ethnographic questions by participants. They need to develop one local art genre into a simplified form that will allow composition by the participants. Phase 3 Facilitators - Guide small groups as they work through the CLAT steps with a community someone in the group knows well. Arts with God Facilitators - Organize daily Arts with God sessions. HOW CAN I BECOME AN ABF LEAD INSTRUCTOR? If you want to become an ABF instructor, compare this description of tasks and competencies to your own background. Then contact ArtsForABetterFuture@gmail.com to make a growth plan. We normally want new Instructors to teach with someone who has already taught ABF. Oversee the one-week workshop training environment and participants’ progress through Create Local Arts Together materials. Coordinate logistics with local organizers to maximize learning and health. Present a CLAT story in 1-2 hours, in Phase 1. Lead students through engaging with a community representative through all CLAT steps, in Phase 2. Coach participants through their small group CLAT projects, in Phase 3. Tell a CLAT-based story based on your own experience in 1 hour (Phase 1). Guide participants as they work with a Community Representative (Phase 2). Coach participants as they make plans for a community they know (Phase 3). do each of the CLAT steps in other contexts, whether identified as part of CLAT or not. Take notice of how people are doing and issues that come up, modifying the schedule to meet needs while accomplishing course goals. Adapt teaching methods, illustrations, vocabulary, etc. to fit local context. Teach in other contexts that use related skills. These could include song-writing or arts creation workshops, Planning the Future of Your Language workshops, etc. Research = Learning = Ministry = Love." Registration for Facilitator Training is open! Or stay for the ABF Facilitator Training the next week (Mon-Fri)! Two shuttles will be available on Sunday (June 3) afternoon before 4 PM to transport participants from DFW International Airport to the International Linguistics Center. If you require transportation, please email arts4abetterfuture@gmail.com. If you have additional questions regarding housing, you can contact them at housing_dallas@sil.org or 972.708.7426. Meal options depend upon your registration selection, so carefully read the options at the registration site. If you have any dietary needs or other further questions, please email arts4abetterfuture@gmail.com. Author of the manual Researching and Creating Together: How Local Artists Can Help Communities Reach Their Kingdom Goals. In 2017, the first Instructor Training course for Arts for a Better Future (ABF) was held at Dallas International University (formerly GIAL) in Dallas, Texas. Instructor Training will be held each year in Dallas following the week of ABF. The process for becoming an ABF instructor is rigorous. It begins by taking ABF twice, then attending the Instructor Training workshop, followed by a period of practice and co-teaching with other certified instructors. If you wish to host an ABF in your area, contact arts4abetterfuture@gmail.com to arrange for two co-facilitators for your event. Brian Schrag, Robin Harris, Tom Ferguson, Wendy A., Laura R., Chris Gassler, Jhonny Anderson Nieto, Héber Negrão, and Elsen Portugal.